Welcome back to Sunday Stamps.. Wow what an amazing turnout for last week's color challenege.. So many great cards! This was also our last challenge with our Guest Designer Tiz.. Thank you for joining us this month, we loved working with you! Thank you again for joining us and we will see you all back here in a few hours with a fun new Sketch Challenge! 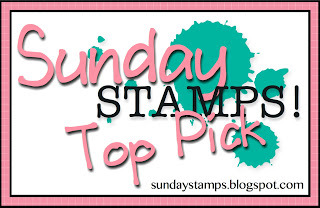 Thanks so much for including my card among the Top Picks this week. I'll be proud to have the badge on my blog. Congratulations to Bine and Rachel. Your cards are awesome.